Interested in a humanities degree but not sure where to go? Learn more about the best undergrad schools for humanities majors by salary. Who says English majors can’t earn a decent paycheck? In fact, for some schools, humanities majors actually earn a higher median salary than the median salary of all the school’s graduates overall. 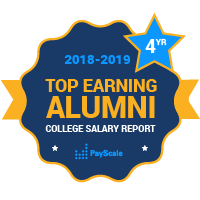 If you want to earn a degree in literature, philosophy, a foreign language or any other humanities subject, the colleges and universities included in the PayScale College Salary Report’s list of best schools for humanities majors will help inform your decision about which school to attend. The salaries of humanities majors have some of the biggest growth over time, mostly because the early career salaries of most humanities majors are lower than those of people who studied computer science or engineering, or other STEM subjects. However, graduates who studied the humanities at several humanities schools often report median mid-career salaries over $100,000. A bachelor’s degree in the humanities can equip you with everything you need for a successful career. Humanities majors become adept at writing, critical thinking, analysis and verbal communication. However, you can increase your earning potential by taking advantage of non-humanities classes that compliment your intended career path, whether that means picking up technical skills or mathematical skills like statistics.